5 Great Benefits of Branded Tents for Events | Dynamic Gift Blog! When people think about advertising today, they, most of the times, think about online campaigns. However, traditional advertising is really far from dead and branded tents for events are just another simple yet great solution. Today we are going to find out how custom pop up tents can help your brand grow and why you should consider using them the next time you attend an outdoor event. First and foremost, custom event tents do not require a professional to set up. Although they are stable and durable, putting them together is just a matter of minutes and everyone can actually do it. Apart from this, though, if you have many events to attend and you need to take your pop up canopy with you, these folks are really easy to carry around. They are lightweight, and you can take them from one big event to another, without the need of a dozen of strong men to carry them. 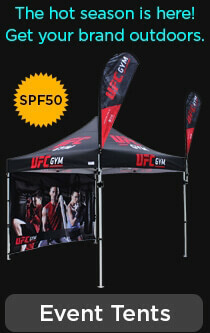 Yes, in case you wondered, pop up canopies do not come in specific sizes and colors. In fact, you can customize them yourself so you can reach a result that actually meets your needs. You can choose the colors, the designs, the print, the graphics, literally everything. So, due to the fact they are so adjustable and affordable, at the same time, you can have different custom logo tends for different events your company is participating in. Someone could say that you could also just go to an event with a poster or something like that so people can be aware of your brand. However, by providing a solution to practical problems like the sun or the rain, you multiply the possibility of people noticing you while, at the same time, it feels like you have your own outdoor shop or office. By setting up a custom tent, you are inviting people into your space, which you can decorate the way you want, no matter your surrounding environment. In big events, companies usually try to approach potential clients or customers. With custom canopy tents though, the tables turn, and people come to you just to take a look at "this company which has a great tent." Just be careful when you are designing your graphics and make your tent feel like a booth which welcomes your visitors in. Let's be honest. When companies attend a big event, either indoors or outdoors, they want to catch the other attendees' attention. Sure, some businesses will create great graphics, posters, even flyers just to stand out of the competition. But with a tent, you just instantly maximize your presence and people will want to get closer due to their natural curiosity. Also, even if people do not visit your tent, its size is going to make them look at it, and they, at least, get to know your brand name. Also, you want to be true to your brand and design your tent respectively. Your business identity is what determines your tent design. So, now that you know why branded tents for events are such powerful tools, you need to build one right away. Click here to contact us. We'd be more than happy to help!